This excellent CD offers us a chance to hear some of Scheidt’s less well-known compositions performed with elegance and passion under the rubric of sacred ‘concerto’s in that word’s seventeenth century meaning. Apart from a period of study with Sweelinck between 1607 and 1609, Samuel Scheidt lived his entire life in Halle on the Saale, where he was court organist and had the opportunity to work with such leading composers of the day as Praetorius and Schütz. His elevation to Hofkapellmeister in 1619 ushered in a brief period of productivity for Scheidt, both in composition and publication. But the bloodshed, disruption and destruction of the Thirty Years War adversely affected that opportunity… particularly in terms of the curtailed forces for which Scheidt’s sacred music was composed. Wies Gott gefällt, for instance, has been arranged (reconstructed, really) here with more performers than called for in the original score and the inclusion of a couple of sinfonias from the 70 contained in the composer’s 1644 collection. 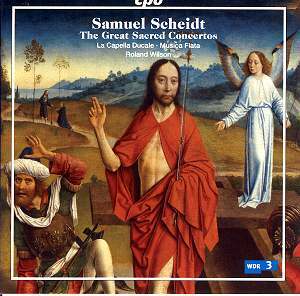 You need not be wary of this, Scheidt wrote that the pieces were to be used… ‘for any concerto or motet at the beginning, in the middle or wherever you want.’ This is the longest of the nine works on this excellent CD and has some beautiful and memorable themes and sound painting. A similar conclusion is easily reached for Kommt her, ihr gesegneten; in particular the addition of a trombone trio and a coro di luti for the forces of evil and good respectively point up that contrast as the latter employs heavenly figures and the former chromatic descents into… the other place. Lovely. Contrapuntal sections from the original hymns and triple time homophonic material alternate in both Nun lob mein Seel and Freu dich in ways (particularly the very effective use of a double choir) redolent of Schütz. In fact the latter was written in 1628 to celebrate the wedding of a Halle couple who were to buy a house from Schütz! Warum betrübst du is an animated piece celebrating – at such sorrowful times – the resilience of the spirit… choirs and soloists exchanging, almost dancing on, expressive text and uplifting music testifying to the God who ‘aller Ding erschaffen hat.’ Starting sombrely, it builds its confidence through a kind of static and understated certainty to which the performers here more than do justice. It’s in contrast to the more conservative (and probably earlier) Ist nicht Ephraim while Christo, dem Osterlämmlein and Ich bin die Auferstehung are two of more than a hundred ‘sacred songs for five voices in the madrigal style’ offered by Scheidt to the Duke of Braunschweig in 1642. Exemplary in the arrangements of these pieces is the restrained addition of instruments specifically to emphasise key moments in the text and to underline the return of the unadorned main melodies. Earlier still (1638?) is the joyous polychoral Nun danket alle Gott; it was written at a time of some loss for Scheidt – although he kept his Hofkapellmeister position, he lost his position at court and had to rely on teaching and occasional composition for his survival. Scheidt died in poverty. Musica Fiata and la Capella Ducale have all the right sensitivity towards the nuances, strengths and emotions of this music without undue indulgence. The instrumental playing is individually clear and wholesome. The singing is beautiful and transparent. The one quality that stands out through the many shades and turns these performers make in exploring some of Scheidt’s most persuasive music is their ‘genuineness’. The tempi are regular, the singing down to earth yet inspired. Behind the always-resisted temptation to over glamorise the more brilliant moments (e.g. the end of Nun danket) can be perceived a very real conviction to communicate what Scheidt wrote in its musical context and with sophistication and enthusiasm. Exemplary. Despite the odd typo in the English translation of the text, the booklet is useful and comprehensive with full texts in German and English. It’s an atmospheric recording with much to commend it. None of the works here is available elsewhere and they all have special and lasting appeal.